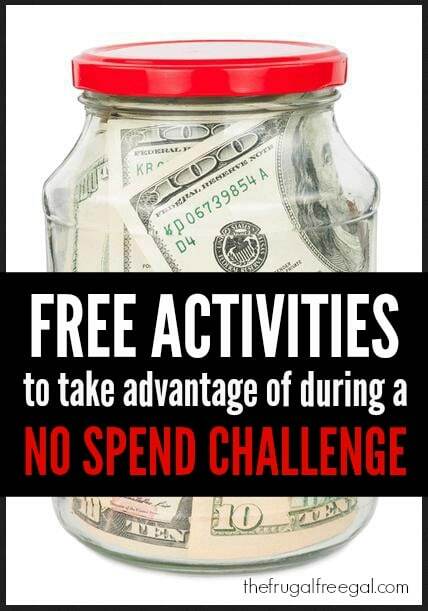 During a no spend challenge, it can be tempting to spend money! When we go so long swiping our cards here and there without much thought, it can be challenging to refrain from spending money. We have to stop before each purchase and ask ourselves whether or not the item is something we need and can afford and whether or not we have the time to take care of that item once it’s in our homes. You’d be surprised at how many things we “think” that we need only end up being “wants” instead. Weekends can be tricky during no spend challenges. If you have kids at home, it can be challenging to constantly entertain them and provide activities that are always free. Weekends are also the time when many people travel. During these weekends, we spend more money on gas to get to and from, convenient store purchases for sodas and snacks, and money on activities once we get to our destination. If it’s not a day trip, we spend money on hotel rooms for a cozy place to lay our heads at night. Over a weekend, purchases can add up! And of course, weekends are often times saved for shopping. Avoid heading out to your favorite local retailers, thrift stores, or even shopping online during a no spend challenge month. That’s why I’m here to provide you with a list of activities and things to do during a no spend month that do not cost a thing. With enough planning and preparation, you can create a schedule for each weekend to help you avoid spending during a no spend month. By doing this, you will be less tempted to spend a lot of money on weekend outings that are costly. Visit your local library and check out books and other library freebies offered. Research parks in your area and visit a new park. Plan a picnic out at a park. Find a catch and release pond and catch fish. Go for a bike ride around the neighborhood with the family. Take the kids to a neighborhood pool. Plan a family movie night at home and stream free movies. Try Amazon Prime 30-Day Free Trial (We stream free movies and TV through Prime). Play board games, cards, or dominoes. Download and play free apps. Download the FREE Kindle Reading App and download free Kindle Books. Play with your kids in the backyard. Build a fire (if you have a fire pit) and sit around it and talk. Go through old photos, baby books, and memory boxes. Enjoy a beverage on your front porch or back yard. Put some music on and clean your house. Visit Pinterest and make a craft with items you already have. Try Amazon Music Unlimited 30-Day Free Trial . Find and attend a good church. Take advantage of free Educational Websites for Kids. While some of these ideas sound a bit more entertaining than others, the key here is to find something to do to fill your time instead of going out somewhere and spending money. It takes a little bit of time to get used to managing our time and replacing the costly activities with activities that are completely free, but it can be done! Use these examples above and plan out the remaining weekends during this no spend challenge. If you have any free activities that you’d like to add to the list, feel free to leave them in a comment below. What free activities would you add to this list?